SHEEMA – Hundreds of farmers in Sheema District are set to benefit from UGX764 million sericulture project that is being rolled out by Private Sector Foundation Uganda (PSFU) and Ankole Western University (AWU). The five-year project is set to train farmers in sericulture, and make this venture key in sustaining livelihoods among households. Sericulture is the art of rearing silkworms for the production of silk which is a key in the textile industry. 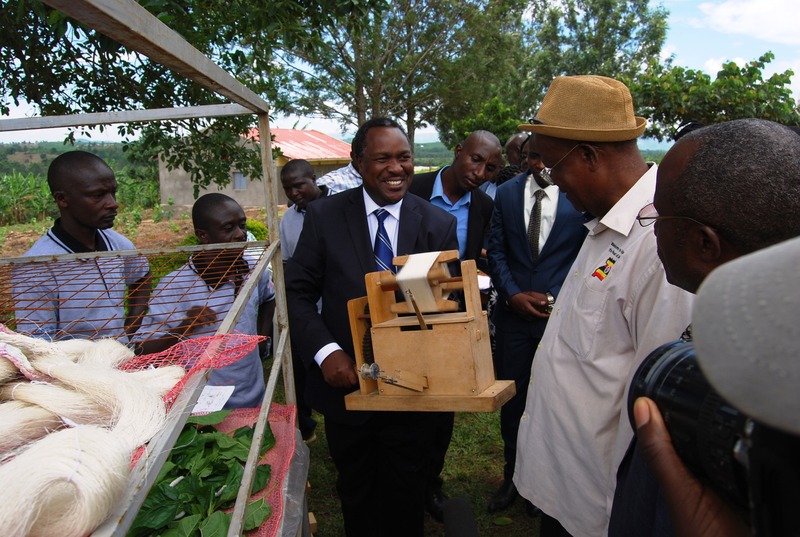 While launching the project on Monday, April 8 at AWU, MP Sheema Municipality also minister for Science, Technology and Innovation Dr. Elioda Tumwesigye, said sericulture in Sheema dates as far back as 2003 but the programme could not take root because of several challenges including lack of funding and limited uptake by farmers. “We pioneered this sector in 2003. The President even came here and launched its factory but it never took off as expected because of very many challenges but I am very optimistic that under this project, farmers will take it up and it is my dream of making this crop a reliable product for sustainable livelihood to the people of Sheema,” said Mr. Tumwesigye. He said with this project they will make sure at least every family in Sheema gets involved in sericulture noting its high demand on both local and international market makes silk growing a reliable project to improve household incomes and end poverty. The Vice-Chancellor AWU Dr. Wilberforce Kamukama, said the university initiated this project as one of the ways to positively impact on lives of the communities through raising family incomes and ensuring sustainable livelihoods. He identified among the project objectives being providing farmers with skills in the sericulture, creation of employment and increased production. “This is a community university. We sat and looked at what avenue we can use to contribute to the sustainable livelihood of communities around us, that’s when we came up with this project to mobilise and skill our farmers in sericulture,” Mr. Kamukama added. Mr. Naboth Mugume, the Sheema District entomologist who is also the project coordinator, said sericulture is a viable project in steadily improving house incomes, and will train as many farmers as possible to benefit from this project. He said that in one acre of mulberry a farmer can get UGX1.6m in one month. Dr. Edith Kakuba, an official from PSFU, said this project is funded under Uganda Skills Development Project funded by the World Bank, and that it looks at giving Ugandans employable skills and competencies relevant to the job market. “We carefully analysed this proposal critically and found out that the project in effect was key in increased production, job creation and skills development. That’s how this university got this funding,” said Dr. Kakuba. She said at the end of this project, they expect to see community silk promoters skilled, value addition, increased production and achieve human resource capacity for self-employment among others. Officiating at the function, the minister for Tourism, Prof. Ephraim Kamuntu, said the university anywhere must be relevant in addressing community challenges and short of that it remains like a secondary school. The first batch of 150 farmers has already started training at the university in sericulture.